As you may have heard, I recently released the Anti-Detox, a new book of high nutrient antihistamine and anti-inflammatory rich all liquid recipes for those days when when I was feeling my histamine bucket gearing up to splurge all over the place. This is a recipe I really wish had gone in there, but the wonderful chef Edward O’Neill (of The Naked Radish) and I just met out here in France, coming up with this recipe for a super healthy themed lunch, and hey, now you’re getting it for free! And looking for the upside is pretty much what this blog has been about since its inception. “Condemned” to the weirdest diet I had ever heard of (and believe me, there have been some doozies, more on that in the Anti-Detox book) in 2010, I pretty much went to pieces when I realised I’d have to cut out all my favourite foods, but at the same time my type A, controlling personality breathed a massive sigh of relief at the thought there was a way to take charge of my insanely frightening health decline of the previous years. And there really was. I’m so grateful that I was initially diagnosed with histamine intolerance and told the only treatment was diet, because once I got my mast cell activation diagnosis, you better believe those folks thought I was completely barking mad when I told them I was managing my symptoms through lifestyle changes alone (thank you very much) and that I had no intention of taking multiple meds so I may once again enjoy “real” food. The items under discussion: pizza, pasta, coca cola. It was my turn to look at them as if they’d lost the plot, telling them I no longer considered said items to be “food”. Which brings me to the point of today’s post (other than sharing a delicious healing recipe with you of course! ): gratitude. I can honestly say that gratitude is something that had been missing from my vocabulary. While I certainly knew many people far better off than me, I definitely led a very privileged life. The wheel of fortune spun fast and hard for my mother, causing many upheavals and instability, but there was never a shortage of shopping trips, tech gadgets and trips around the world when I was growing up. Flying around in private jets, beautiful boats, champagne and all that jazz were pretty much the norm. And yet, my mother and her friends often lamented my completely blasé attitude (direct quote heard many times) towards this bounty. Eventually unable to process why I couldn’t enjoy any of it, I escaped, cutting contact with all my friends and everything associated with my home town – running off to work 16-20 hour days as a journalist, grounded by the horror of “reality” around me. But this entitled attitude followed me into my work life and more frighteningly into my health struggles. I believed that good health was my god given right and that I had every reason to scowl my way through life because I was shortchanged. Pouting, crying, railing against my misfortune in not being able to enjoy the very things I had rejected decades before, I fed the toxicity I was sure I had left behind in my home town. But of course, in leaving home I still had not addressed the root of my malaise: my inability to give thanks and my gratitude to the universe, my mother and all my wonderful friends who scratched their heads in bewilderment the day I tossed them aside with as much ceremony as the kleenex I used to violently empty my inflamed sinus passages into. I am grateful for having found all you amazing people who have allowed me into your lives, inspiring me to continue my research and blogging, in addition to supporting my work so that I can actually feed myself while I do so! I am grateful for having experienced extreme adversity in life, for me at least, it was a necessary part of the learning process. I am grateful to this illness for having taught me how much I value being alive (there was a time I craved oblivion) and for forcing me to become the absolute healthiest I have been in my entire life. I am grateful for all the wonderful people who have come into my life now that I am ready for them. I am grateful to my (not so extended family) P&RS, for their tireless work in helping me understand that I am a human being of value who deserves to be treated as such, and for the latest addition to their brood, who I can’t wait to meet. I am grateful to my mother, she did the absolute best she could and I’m very thankful it was more than enough to raise me as an (eventually) grounded person with an incredible toolkit that made me into a successful journalist. I am grateful to HM for being my surrogate mom, best friend, cousin, confessional priest, who, even when I was at my absolute lowest in life, never made me feel like I was. And I am of course very grateful to this healing soup and all others that have allowed me to regain control of my health. Now, before we dive into the recipe du jour, I’d like you to make me a promise: you’ll get yourself a nifty little diary to keep at your bedside, and fill it with at least five things your grateful for, nightly. Why? Gratitude has been shown to lower inflammation, boost quality of life and increase happiness . Not bad for something that can be practiced in as little as a few minutes a day, right? Antihistamine: artichokes, onion, garlic, broccoli, thyme, basil, chives. Anti-inflammatory: artichokes, onion, almonds, coconut, garlic, lemons, broccoli, mushrooms, thyme, olive oil, chives, basil. Clean the artichoke by peeling off the leaves and furry bit, till you’re left with just the hearts. Place in a pot with the lemons and then pour in enough water to cover. Sauté the garlic, onions, mushrooms (if using), broccoli juicing leftovers and thyme in a little olive oil till soft. 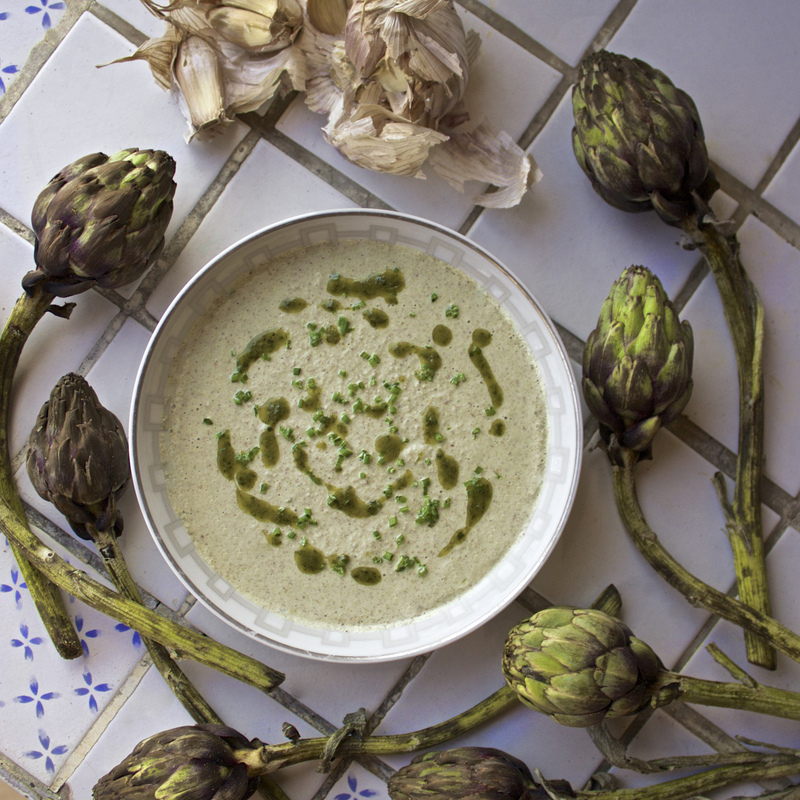 Blend with the almond/coconut milk, half a cup of the artichoke water and the veggies. Garnish with chives and drizzle.